Purpose: This study seeks to evaluate the satisfaction of trauma-affected refugees after treatment with antidepressants, psycho-education and flexible Cognitive Behavioral Therapy (CBT) including trauma exposure. Material and methods: A treatment satisfaction questionnaire was completed by patients at the end of a randomised controlled trial (RCT) comparing treatment with CBT and antidepressants. A patient satisfaction score was developed based on the questionnaire, and predictors of satisfaction were analysed in regression models. Telephone interviews were conducted with patients dropping out of treatment before the end of the trial. Results: In total, 193 trauma-affected refugees with PTSD were included in the study. Patients were overall satisfied with flexible CBT including exposure treatment in cases where this was part of the treatment. There was no statistically significant association between treatment outcome and satisfaction and satisfaction and treatment efficacy were independent of each other. The results showed that bi-cultural patients who had lived in Denmark for more than a decade were satisfied with the treatment based on a western psychotherapy model. Discussion: Treatment with selective serotonin reuptake inhibitor and flexible CBT, including trauma exposure, is acceptable for trauma-affected refugees. More studies are needed to evaluate patient satisfaction with western psychotherapy models in refugee patients who have recently arrived and to compare satisfaction with alternative treatment models. Bech, P. (2012). Clinical psychometrics. Oxford: Wiley Blackwell. Buhman, C., Mortensen, E. L., Lundstrom, S., Ryberg, J., Nordentoft, M., & Ekstrom, M. (2014). Symptoms, quality of life and level of functioning of traumatized refugees at psychiatric trauma clinic in Copenhagen. Torture, 24(1), 25-39. Buhmann, C., Andersen, I., Mortensen, E. L., Ryberg, J., Nordentoft, M., & Ekstrom, M. (2015). Cognitive behavioral psychotherapeutic treatment at a psychiatric trauma clinic for refugees: description and evaluation. Torture, 25(1), 17-32. Buhmann, C., Mortensen, E. L., Nordentoft, M., Ryberg, J., & Ekstrom, M. (2015). Follow-up study of the treatment outcomes at a psychiatric trauma clinic for refugees. Torture, 25(1), 1-16. Derogatis, L. R. (1994). SCL-90-R: Symptom Checklist- 90-R. Administration, scoring and procedures manual (3rd ed.). Minnesota, USA: National Computer Systems. Foa, E. B., Hembree, E. A., & Rothbaum, B. O. (2007) Prolonged Exposure Therapy for PTSD: Emotional Processing of Traumatic Experiences, Therapist Guide. Oxford, UK: Oxford University Press. Hamilton, M. (1959). The assessment of anxiety states by rating. Br J Med Psychol, 32(1), 50-55. Lam, R. W., Michalak, E. E., & Swinson, R. P. (2005). Assessment scales in depression, mania and anxiety. London: Taylor & Francis. Noerregaard, C. (2012). Kultur og biologi ved psykofarmakologisk behandling af etniske minoriteter. [Culture and biology in psychopharmacological treatment of ethnic minorities.] Ugeskrift for laeger, 6, 337–340. Olsen, D. R., Montgomery,E., Boejholm,S., Foldspang,A. (2007). 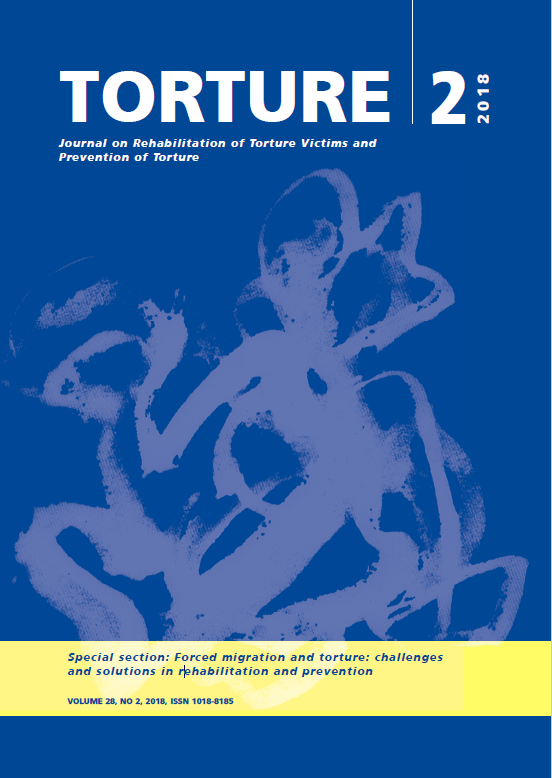 Prevalence of pain in the head, back and feet in refugees previously exposed to torture: A ten-year follow-up study. Disability and Rehabilitation, 29(2), 163-171. https:// doi.org/10.1080/09638280600747645 Oruc, L., Kapetanovic, A., Pojskic, N., Culhane, M., Lavelle, J., Miley, K., Forstbauer, S., Mollica, RF & .Henderson, D.C. (2008). Screening for PTSD and depression in Bosnia and Herzegovina: validating the Harvard Trauma Questionnaire and the Hopkins Symptom Checklist. Int.J.Culture Ment.Health, 1(2), 105-17-133116.